Build Your Own MINI BEEP (Jeep) Amphibious Off Road Truck! - Muscle Cars Zone! Build Your Own MINI BEEP (Jeep) Amphibious Off Road Truck! In this one we are more than happy to introduce the Mini Beep which is an amphibious off-road vehicle that you can make it by your own. This is the world`s only off-roading amphibious vehicle that you can build it by yourself from a kit. This scaled down mini off-road vehicle is a true workhorse. It has the ability to cut acres of weeds. You had a huge snowstorm last night? Well, no problem, this insane little vehicle will definitely help you sort out that problem. This can also be a farmer`s best friend as you can haul a huge load of hay with this one. This little off-road vehicle can spoil you so much because with it you can actually fish on a lake of your preference. 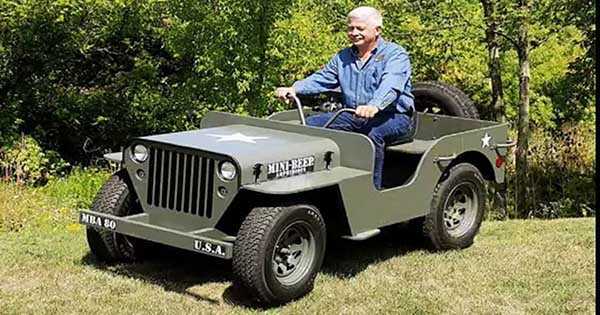 This Mini Beep is actually a WW2 Jeep replica which is powerful enough for all kinds of off-road adventures, pulling trailers, bulldozing sand, driving in water and much more. So, if you are a DIY enthusiast, then this could potentially be your dream project. We are not only speaking about the end product which is an amazing scaled-down off-road vehicle, but also the hours that you`ll spent building it can be a splendid reward unto itself. By building this Mini Beep, you can also engage your grandchildren or kids on the project and teach them some pretty useful skills along the way. You`ll also spend awesome quality time learning great and creative things. This Mini off-road vehicle comes in two versions, 2WD and 4WD. At last, check out this adorable mini Kenworth truck!